We can go to the moon, split atoms to power submarines, squeeze profits from a 99 cent hamburger and watch football highlights on cell phones. But the most successful democracy in human history has yet to figure out how to conduct a proper election. As it stands, the American voting system is a worrisome mess, a labyrinth of local, state and federal laws spotted with bewildered volunteers, harried public officials, partisan distortions, misdesigned forms, malfunctioning machines and polling-place confusion. Each time, problems pop up on the margins; if the election is close, these problems matter a great deal. Republicans and Democrats predict record turnouts, perhaps 130 million people, including millions who have never voted before. The vast majority will cast their votes without a hitch. But some voters will find themselves at the mercy of registration rolls that have been poorly maintained or, in some cases, improperly handled. Others will endure long lines, too few voting machines and observers who challenge their identities. 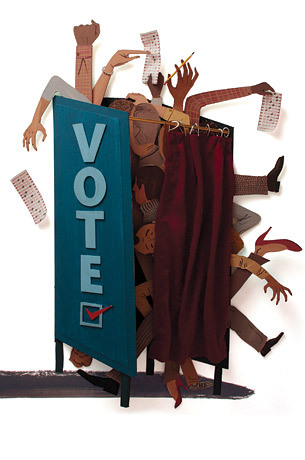 Long a prerogative of local government, the patchwork of election rules often defies logic. A convicted felon can vote in Maine, but not in Virginia. A government-issued photo ID is required of all voters at the polls in Indiana, but not in New York. Voting lines are shorter in the suburbs, and the rules governing when provisional ballots count sometimes vary from state to state. As Americans cast their ballots on Nov. 4, here are some problems that threaten to throw this election to the courts again.